These sure are brooding times. But things can and do change. After a marauding group of ‘city folk’ arrive unannounced to cherry pick the quiet jungle communities’ best and brightest, leaving the too old and too young behind to fend for themselves among the bodies of those who showed too much resistance, Jaguar Paw, son of Flint Sky, finds himself tied to his friends and marched unceremoniously towards an unknown fate. Ordinarily this would be bad enough, however with every painful forced step Jaguar Paw trembles with the knowledge that his young pregnant wife and young son hide away in a deep hole from which there seems little chance of escape. And all the while dark coulds form overhead. In the jungle things were peaceful. Serene. The city is a far more daunting and complicated place, where the lucky ones are sold as slaves. Some of the others are sacrificed in the hope that their spilled blood will appease the various Gods, putting an end to disease and famine. In other news you won’t believe how easy it apparently is to pull out an intact heart from a torso, nor how simple to sever a head from said body. Apocalypto has an overly complicated prophecy that nonetheless keeps being proven, a great many casualties – well genocide level casualties frankly – a little divine intervention and some plain luck. The last hour or so is one last adrenalin fuelled chase scene, with the clock ticking just as fast as the amazingly fit pursuers close the gap on their desperate prey. A ‘prophecy’ can be used as a cure-all to justify a few too many plot conveniences for mine, and while the savagery, mass murder and the cultural habits of the Mayan people makes the film fresh, interesting and often exhilarating, the film is essentially 10,000 BC with ‘big boy pants on’. Final Rating – 7.5 / 10. 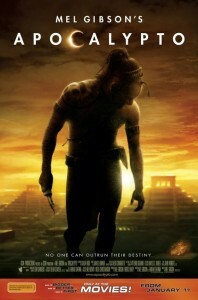 Apocalypto is at times powerful and overall is well realised, yet despite the many plaudits from critics, it is not great.